We are born with a lifetime supply of something you may not think about every day: Nephrons. 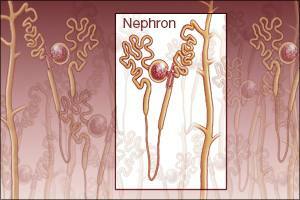 Nephrons act as filters within the kidneys. They fine tune blood composition which in turn maintains our blood’s pressure, volume, and cleanliness. During pregnancy nephron development ends as a fetus reaches the last weeks in the womb. But unlike our standard ten fingers and toes, nephron numbers vary widely---from 200,000 to 2.5 million according to researchers. Genetic influence, maternal diet and health, as well as exposures to certain substances (antibiotics, alcohol, non-steroidal anti-inflammatory drugs) contribute to variation in nephron numbers, as does preterm birth. For this reason, birth weight is linked to nephron number. Low birth weight in a baby can equal low nephron numbers and if that baby becomes a tall adult, possibly a higher risk for hypertension and chronic kidney disease? How does that work, I wondered. Dr. Rule and coauthors cite two population-comparison studies in Sweden and Finland. In the Finland study, the highest hypertension risk was linked to low-birth-weight babies with continued accelerated growth past age seven. The Swedish paper found that males born at less than 7.2 pounds who were above 5’7” at age 50 had particularly high blood pressure compared to the other participants in the study. They add, however, that it was only problematic for those in the upper 1/3rd of body mass index (in this case, with BMI of 26 or higher). The idea is this: In low birth weight babies the growth potential of the fetus was not reached. But as these infants catch up to their peers and attain full growth, those who grow taller or heavier (or both) than the norm may eventually outstrip their kidney’s innate filtering capacity. The result? Higher risk for chronic kidney disease and cardiovascular disease. We should all care about nephrons. But what if you were a normal weight baby who has grown into an average height adult? Well, considering the kidney’s filtering ability seems to decline naturally after age 40, you’re not off the hook. For you, the National Kidney Foundation has a six step guide to kidney health and of course, you should always talk to your doctor for accurate assessment of your health, kidneys and otherwise. Not sure about you, but I’m off to drink a nice glass of water in solute (chemistry joke!) to my hard working nephrons.